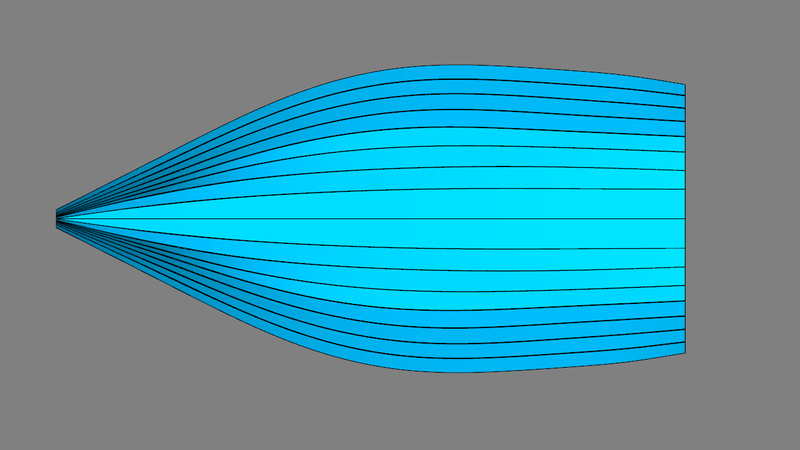 Synergy Marine has started development of a new Merlin Rocket designed by Dave Hollom. We will be producing a new mouldset over the course of the year with the intention to have the first boat sailing towards the end of the year. "As can be seen the boat amidships has a V section and a distinct chine both of which reduce drag when on the plane. V sections have less drag when on the plane than U sections, for a multitude of reasons that I will not go into here, but when was the last time you saw a U sectioned planing powerboat without a chine? The V in the centre of the boat also allows a narrower waterline beam than a U section whilst still complying with the rise of floor measurement. The narrower waterline beam reduces wetted surface area, which will help in lighter airs, but also, because the water doesn’t have to go as far to get around the boat, reduces velocities in this area. This is useful because lower velocities mean less suction (Bernoulli’s theorem) and the less the suction the more easily the boat will rise onto the plane. 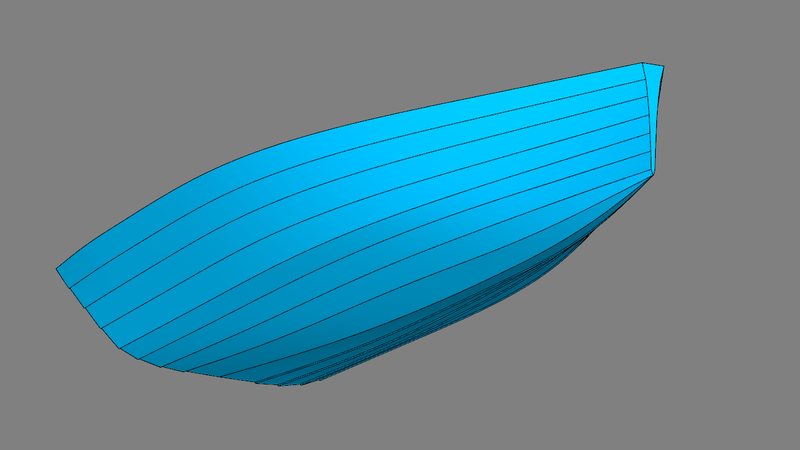 It also, again for reasons I will not go into here, reduces lift induced wave drag which will allow the boat to sail either higher or faster or a combination of both when on the wind. 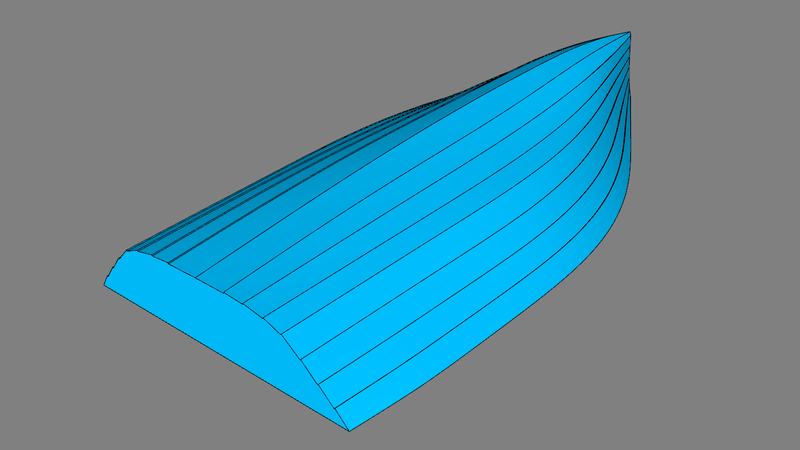 This V section morphs into as much of a U in the bow as is possible with a clinker hull together with a reasonably flat stern The idea is to move the displacement lost in the middle of the boat to the ends of the boat and thus increase prismatic which reduces wave drag at most of the speeds of interest, without making the bow waterline any courser. 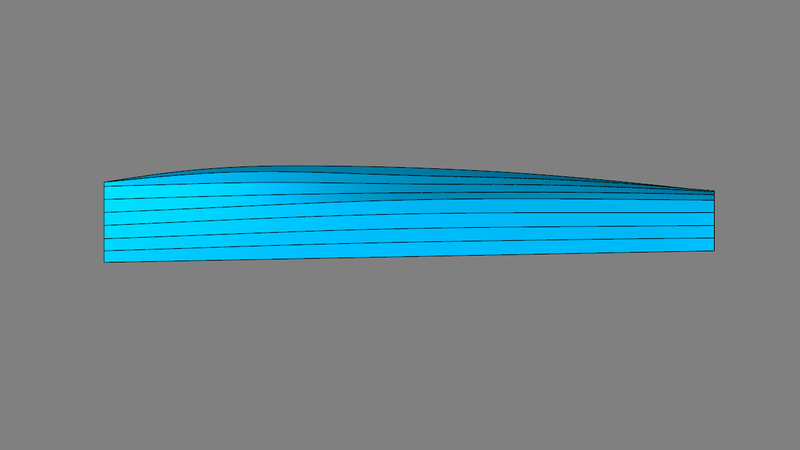 In particular, a high prismatic reduces drag at the important hump speed and so allows the boat to get onto the plane more easily. The characteristics of both the International 14 and the National 12 are that they plane sooner and once on the plane are faster. Merlin’s are very nearly capable of planing to windward with advantage but aren’t quite there yet. I fully expect that this new design will break through that barrier and be capable of planing to windward with advantage." We will provide regular updates of the development of the boat over the coming months but anyone with a serious interest in this design or potentially purchasing one of the first boats please get in touch!